We tend to throw the word “addiction” around loosely, saying of anything that we do routinely and often that we are “addicted” to it; for example, that “She’s addicted to Facebook,” or “He’s addicted to texting.” Of course, some addictions are quite serious matters with mostly negative consequences not only for the addict but also for those in his or her circle of relationships and for society. Psychologists at Iowa State University recently announced the results of a national study of video game playing among 8 to 18 year olds, and their findings, the first of their kind, are cause for concern: nearly 1 in 10 players are “pathological users,” or video game addicts. According to the lead researcher, assistant professor of psychology Douglas Gentile, “What we mean by pathological use is that something someone is doing—in this case, playing video games—is damaging to their functioning. It’s not simply doing it a lot. It has to harm functioning in multiple ways.” The American Psychiatric Association is considering adding this addiction to its Diagnostic and Statistical Manual of Mental Disorders (DSM), should the scientific evidence warrant its inclusion. The study was based in large part on the close resemblance, in terms of symptoms, of obsessive video game playing to pathological gambling, which is an officially classified disorder. 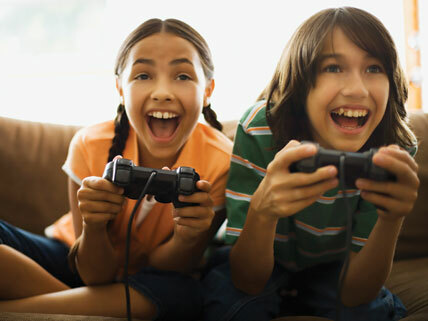 The American Medical Association sees potential video game addiction as a health issue and has expressed official concern about the well-being of young people whose time spent playing video games is interfering with their ability “to develop friendships, get appropriate outdoor exercise,” or keep up with schoolwork. Overexposure to violence is a further problem related to this behavior, whether we call it an addiction or not. So who cares about videogames? Its bad for your heart and kill you. So why play videogames? I know right i don’t even like video games i hate them now. Basically my question is what eleemnts/other things does a good mmorpg need to make people want to play it. Like WoW for example it has story and stuff. So basically im just asking for kind of like a list of what a good mmorpg has in it and needs. Thx. How are Video Games bad for your heart? I HATE Call of duty and shooters, but how are they bad for the heart? Video games are a way to escape the cruel world we are in. But life is not a video game, there is no reset button. lauren spelt parents wrong that’s why are parents are on us about video games… Some people don’t even know how to spell because their brains are turning to mush!!! My bro plays video games every day and he gets A’s in ALL his classes.so I don’t agree with Hanna at all. -_- However, you are not being grammatically correct yourself. I rest my case. I agree with Hanna !!! Get out of the house play a sport do something take a break from video games!! They fail to note that there is a healthy addiction to video games. They can improve motor functions drastically. A good friend of mine was a video game addict, and now he’s a neurosurgeon thanks to it. jt, that is very wonderful. Good blog. I got a lot of good information. I92ve been watihcng this technology for awhile. It92s intriguing how it keeps shifting, yet some of the core components remain the same. Have you seen much change since Google made their latest acquisition in the area? I do agree,JT. All these comments are based on Gamer’s stereotypes. Not all gamers are like this. I at least play two hours of video games per day and pay attention well in class and have very good grades. Stereotypes are what people should be arguing about, not gaming. do sumting else!!! wat if u dont have video games, u can do wumting else anyways tink abt it like tht! Who cares if video games are bad what if its raining. What do we do then?? But its a good idea to get out and play. im 15 and who cares if its raining! I still have specially designated “play clothes”! Be a kid! Were supposed to get out and get dirty! !This might be just cuz im a country boy to though!? u mean dont have any friends? i mean just leave us alONE! I LOVE KILLING ZOMBIES! So what? They can do whatever they want. If they want to ruining their brains, fine. It doesn’t even happen to everyone, too. So just stop the topic, OK? video games are bad, but i like playing them to relax. Video games are the best thing the world has made. Goodbye. The end. End of story. It’s funny how even today I still think of Videopac games by their numbers. #14 was brinaillt, and then there were #41 and #42, which were so frigging cool they even had larger boxes. And #37, where you could have 2 players chasing the apes (and getting chased by them) while another played around with the horizontal and vertical bars. And #20, which was tremendously fun. And #1, and #2, and Also, it was nice how the graphics were extremely simple (they had to be), but the box covers made the games seem so much more than that. Like #11, where I always assumed the red characters chasing us were normal tax collectors, but the box made it pretty clear they were robots. That’s right, in the future they will send robots after you to make you pay your taxes. The problem with the App store is the race to zero and pircay has practically made it impossible to make a profit or even get back your development costs speaking from the point of view of one of those impoverished developers.Ngmoco are trying something different and something more like the original arcade model and while you may not agree with it because you want to pay upfront the problem is that most people on the App Store don’t want to pay up-front because they’re unsure of the quality or they can pirate it for free or simply because the race to zero has made everything cheap to make.I can tell you it’s not, we’ve invested roughly 150K dollars on the development of our game and that’s an awful lot of copies (around 200K) we would need to sell to even break even priced at 99c.Good games cost a lot of money to make and developers need to have a hope they will make it back otherwise the iPhone App store developers will leave.At least this way you get to play it for free and only have to pay if you enjoy it enough to want to play for longer or get additional content. Ngmoco’s business model is quite smart and is used by seaevrl companies now. If you can find a better business model for making a profit from your efforts making a game please let me know I will use it! If game developers can’t find a way to profit from games why would they make them?It sounds more like you are worried you will get addicted to the game! Perfect awensr! That really gets to the heart of it! i think that video games are over rated by parents and the older generation,sometimes video games are the way us young people entertain ourselves. Video games are our way of relieve stress that is brought on by our hard working at school and home. Adults are jealous because they did not have the new technology that our generation has. haven’t you seen willie Wonka? what about mike tv? what is your favorite game you have pylead on ds. Now don’t tell me all the fun games you have pylead or all the best reviewed games just one game and it has to be the number one game you have ever pylead on ds. I know so as well, even though I played it. He just said that already. Yes that is true. All original Xbox games will not have onnlie play because it costs too much to support the servers. Since most players play Xbox360 onnlie. Quit arguing,all of you.Its a free world.We just need to know how to handle ourselves.Playing video games isn’t bad.Its not being able to regulate your playing that’s bad. Yo wazzap people. any one play modern warfare 3? Looking through your wbesite a thought occurred if you ask me. I’ll tell a person honestly that today there are actually so many MMORPGs that I are not aware of what is the perfect play. Again and again produced some new game and it’s also hard to figure out what level they will represent. Obviously as a huge fan of these types of games have its favorites, but these are simply old games that happen to be already that you can buy for several years. I would want to try something brand-new. Do you have any ideas? Hey. Anyone play Modern Warfare 3? This is so lame and if aneything its 1 out of 15 american. i’m not sure that if video games are bad or good but i’m an expert at video games, but i’m so good at video games like pokemon. JUST GET OVER IT ALREADY!!! Oh by the way guys, quit picking on Hanna. There are some people who’s brains have been spoiled. My neighbor is brain dead because of video games, and his brother failed school because he didn’t study and do his homework. He dropped out of school and live with his mom playing video games all the time. I’m glad you guys aren’t that way, but some are. Ya i have it what system do u have it? I like video games, but if you play bad ones, such as Grand Theft Auto, or Resident Evil, they turn your brain to mush! I totally agree with Garret, if you play them too long, they really affect you. 🙁 my poor brother, he played GTA for 30 minutes, and when he stopped, he acted really violent. Yeah, so, my brother and my little sis both had to get glasses because they did video games too much. So sad. Also, my sis is now influenced to follow the violent v.g. and it’s stupid rules. And she is only 8!!! Seriously, people. get outside sometime. I bet all you constant gamers’ skin is totally pale. I for one, go outside like all day. i also try to help my siblings understand that life is not all about gaming. But my older brother is like totally addicted to playing the iPod. he plays it every night for about 4 freaking hours!!! Video game playing is not to be trifled with. Play at least an hour and go outside to be active. Me I play video games and adicked to them thats why i’m on the computer and when i’m done i’m going to play cod or video games for all googyggoogy people out ther. you guys are so weird but its ok to argue about something that everyone has a different opinion of!! so stop saying someones wrong or right ok? Servers are indeed shtniutg down, but you still can play them, just no online play. Not sure if you still want to download DLC if it would still be available though. well your wrong and please don’t report me because I do think your right about that dude. Hey Rinry,Great video. I totally agree, auothlgh FYI…sequels do technically include parts beyond part 2. I believe sequel comes from the work sequence, or series, and therefore SMB3 is technically a sequel of SMB. Not a big deal, just a clarification. A video of Top 5 Part 2’s is just as awesome. video games are ok but just take breaks from them hourly. but then theyll just jump back on. Megaman part 1 does NOT have precise colnrots. Had you played it on NES you would know that. Just sayin’. Otherwise your review is well done and I look forward to more from you, Rinry. video games are very bad for your eyes. it is also very addicting because once you play a game you get addicted to that game. well yeah so we should play at our own risk. Video games are really bad for you little kids. i love video games just not vilent ones. I like video games but it is just that people have so many video games and they need to share because it’s not likely to be non healthy and other stuff. I firmly believe that this addiction of teens is primarily caused by the PARENTS. This so called parents, want to simplify their parenting life would indulge in making their children stay HOME, rather than go outside believing that it will be safer in the house. vidoe games can help your eye sight and hand movement do! Then start liking them! It’s so simple! Listen! While we can agree that being a persuasive speaker is great, but eventually you have to “get something done”. I’ve been addicted to video games for about 6 years. I do indeed play to escape reality. I can’t stop and sometimes cancel plans just to keep playing. I hate video games now but can’t stop. They should not be erased completely from the face of the earth though. Something to lower addiction would be nice though. Focus on the people, not the games. I like a few computer games, but I usually do many other things. is everyone looking at this website from school????? Limits are ok but sometimes us kids have nothing else to do. If kids are addicts to video games why doesn’t the parents stop that. I think kids should play video games just not get so addicted. I play games like minecraft a lot but we should contain the madness over it. An addiction to video games really isn’t healthy, but I personally play a bit myself and it’s a good stress reliever. As long as you balance video games and real life, it really shouldn’t be a problem. Don’t you think they should do one on Minecraft? Because it also is addicting. Because I actually almost got addicted to it! sorry for writing that twice. I never play video games. I amuse myself by reading books. (And i don’t read trashy literature. )In my opinion every body who does play video games should be restricted to 2 hours of game time on a Saturday. (Don’t think i’m a teacher. I am a 13 year old girl)I admit i watch a lot of TV. My mom never lets my 11 year old brother play video games.Not including computer games and game boy. By the way i’ve read all the comments and the spelling is awful. Video games are a very excellent thing, i mean if we didn’t have them then we wouldn’t have many of the devices we have today. so what if they play it too much, there are alot of games out there that are absolutely wonderful! im sure that maybe one out of the couple people that comment on here ether play a tablet or phone or a NES game as a kid or an adult. they aren’t bad at all, parents are allowed to guide their child for what games they should play and what they should not play. the media decides to make the game industry the scapegoat and blaming them on many terrorist attacks, school attacks, and other events. i myself play many types of games, shooters, puzzle, platform, and none of them are at all bad. but for example: as rock and roll was back then considered bad, older generations didnt like it at all. but think, ITS NOT MADE FOR THOSE PEOPLE. The young generation is always changing with every new trend that comes out, video games are probably the best thing to happen, the creativity that comes out of them is truly remarkable. the violence you see in many of them is not that bad as for say, maybe the stuff youd see if you watched a horror movie. I LIKE VIDEO GAMES. ANS SO WHAT, AT LEAST I’NOT ADDICTED TO ALCHOL OR DRUGS. HA! You spelled alcohol wrong. Proof that video games are bad for you. I for one simply can’t imagine that playing, shall we say, Angry Birds makes you become mentally retarded. Neither is texting….Well maybe texting. WOW bad company is not listening. Well I wont be surprised if he gets kicked off of this site or the internet period. (re) 😉 🙂 Just seeing if they work. well i think i would rather have a kid shoot someone on a game then in real life think about it that way. Violent Crime: Is Mental Illness to Blame?